From cutting and colouring to Yuko hair straightening please feel free to contact the salon at any time if you require advice or information about any of the services offered. I take pride in providing a level of service and hairdressing that is second to none. Using very effective precision cutting techniques that not only look great but last longer and don’t require masses of product and hours in front of a mirror at home to re-create. Whether your hair is long or short you can expect and will receive a haircut that is designed specifically for you. Using only the very best in professional colouring products, my preferred colour range is Wella, the largest producer of professional colouring products in the world. This enables me to guarantee that the colours that produced are consistent and are of the highest standard. I am also constantly working to develop the techniques I use, to enable me to offer our customers subtle changes that keep their hairstyles up to the minute and fashionable. All colour formulas used are weighed precisely, to ensure that the colour is consistent and that fade is kept to an absolute minimum. Many hairdressers produce highlights which are a series of different coloured stripes painted onto the hair in a fairly rigid pattern. Bleach is often used as a core ingredient rather than something to add value to a specific effect. I prefer a naturally highlighted look, making the hair look like it has been kissed by the sun. 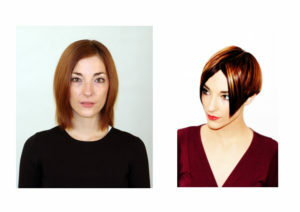 By using unique placement patterns the brighter lights become more apparent when the hair moves, making it look completely natural and giving the hair more fluidity. I avoid placing the brightest lights against the parting or the edge of the hairline, enabling me to conceal where the highlights start. This is made possible by the sympathetic choice of colours and use of the correct placement technique for each individual customer. I am one of, if not the most experienced hairdresser performing hair straightening in Manchester. I have used numerous techniques over the last 12 years (thermal straightening was not available before 2004). I have now developed my own blend of products that give excellent results and are much faster to apply, adding value to the procedure. Please click here to go to a more detailed description. Until recently, permanent hair straighteners have been restricted to virgin hair. Highlighted and damaged hair were regarded as unsuitable, as the hair could process unevenly giving an inferior result. Now, we can straighten most hair, coloured, highlighted or permed. Our thermal permanent system is unique because it protects the parts of the hair that the straightening solution doesn’t need to affect, thus reducing damage and allowing the hair to process more evenly. It takes much less time than other systems, is more economical and gives excellent results with great value. Prices for Thermal Permanent Straightening start at £160.00 for short hair. YUKO SYSTEM was created in Japan as a means of permanently straightening naturally or artificially curly hair without excess damage. Previous methods straightened hair with good results, but it was inevitable – and accepted – that the hair would be severely damaged. YUKO SYSTEM, however, not only straightens curly or wavy hair but also makes hair glossier and shinier. It works using a similar principle to perming hair, the interior bonds that control the hair‘s shape and texture are broken using a strong chemical and after reshaping the bonds are prevented from reforming and pulling the hair back into its original configuration. It should be noted that treating the hair in this way will eventually have a detrimental effect on the hair and following subsequent treatments, there is a possibility of damage to the hair shaft. It is important that if undergoing permanent straightening of any type that you ensure that the right after-care products are used at home and that the hair is cut regularly to prevent splitting. StyleSmooth is a unique new hair treatment. Developed and manufactured in the UK, designed to make it easier to create a salon finish at home. It can easily make your hair straight and it will stay straight or you can add curls or flicks and they will be bouncier and stay in place for longer even in extreme conditions. Frizz is replaced with great shine. Available as a full, medium and mini treatment (medium and mini treatment require a blow-dry), it is effective on all hair types from European to African and contains no ingredients that are subject to restrictions. What causes frizz? Inside the body of a hair is a chemical bond, called a disulphide bond. This bond connects the hair’s protein chains giving the hair its shape. When hair is styled with heat, the protein chains are pulled apart and the bonds are stretched into a new arrangement. When the hair gets damp as in a humid atmosphere, the bond starts to return to its original configuration, pulling the hair back toward its original texture. This is the main cause of frizz. When washed, the hair will return to its original shape. StyleSmooth works by gently expanding the micropores that occur naturally within the cortex of the hair. Our unique Keratin has a very low molecular weight, allowing it to penetrate the hair shaft easily, filling these expanded pores completely. As the hair contracts, the Keratin is trapped inside. Heat is then applied to each shaft, enabling a second larger Keratin molecule to seal onto the outside of the hair and connect to the smaller Keratin molecule inside. The bonds cannot pull the hair back to its original shape because moisture is kept out of the hair and all of the internal space has been filled with our unique Keratin, effectively blocking the internal bonds. Each time the treatment is re-applied (at home) the Keratin levels within the hair increase and a build-up effect occurs, meaning that over time the hair gets stronger and easier to manage. The initial application is performed in the salon, then the remaining product is taken home by the client to use as a weekly maintenance top-up. The bottle contains enough treatment for approximately 24 home applications depending on hair length and thickness. Firstly, the hair is shampooed with a special shampoo that opens the cuticle making it easier for the Keratin to penetrate the hair shaft. Next StyleSmooth is applied to the entire hair and placed under heat for 10 minutes and is left on the hair. The hair is now blow-dried and finally, the hair is divided into small sections and then heat treated at a specific temperature using straightening irons. To maintain the effect the product is re-applied once a week at home – simply wash your hair and apply 10ml (you will need more for longer thicker hair) of the treatment as a leave-in conditioner, comb through from the roots to the ends and style your hair as normal. This intensive, four part, deep conditioning treatment revitalises damaged hair with a combination of protein and moisture to soften and strengthen the hair whilst a fortifying Keratin compound smoothes the hair shaft, finished with a lustre boosting acidifier which seals down the hair cuticle, further increasing the hairs strength. Suitable for all hair types, Long Lasting Treatment will leave the hair smoother, shinier and nourished for up to 10 washes. Going somewhere special – maybe a ball or wedding. I can dress your hair into a multitude of different up styles – from classic chignons to funky fun hair.